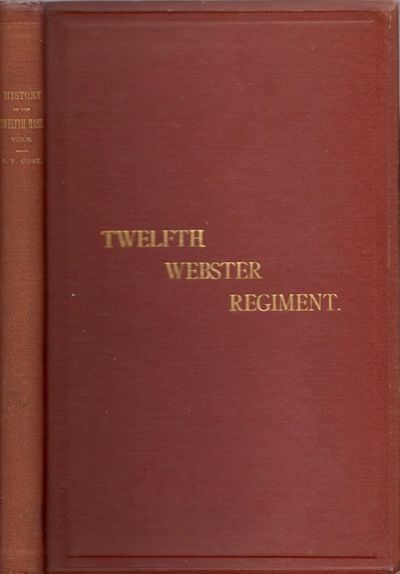 Boston: Published by the Twelfth (Webster) Regiment Association, 1882. First Edition. Hardcover. Very good. 8vo. 167 pages. Frontispiece steel engraved Soldier portrait. Illustrated with 2 plates. Folding map in rear pocket. Brown cloth hardcover with gilt stamped title on front cover. Map in very good condition. Nevins I page 73 - "Relying on diaries by other members of the regiment, Col. Cook compiled an uneven, almost day to day chronicle of the unit's action; the work contains a sprinkling of humor and only scant personal data.